The ABC.com network has a mail server named ABC-EX02 that has Microsoft Server 2008 with Service Pack 2 installed. You receive instruction from ABC.com to deploy Exchange Server 2010 on ABC-EX02 to support the Hub Transport, Client Access, and Mailbox server roles. What action must you take? (Choose all that apply). E. You should run ServerManagerCmd.exe -IP Exchange-Typical.xml. The ABC.com network has a client computer named ABC-WS662 that has Microsoft Windows 7 installed. 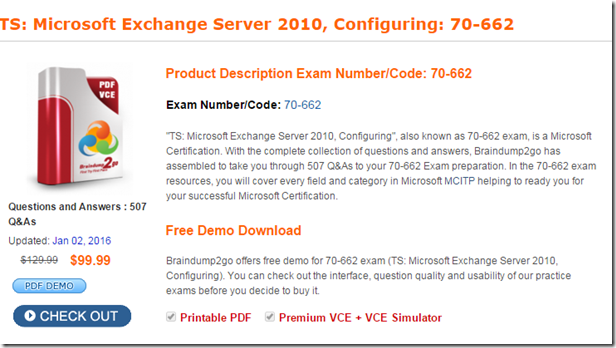 How can you proceed with the deployment of management tools for Exchange 2010 on ABCWS662? The ABC.com network has a mail server named ABC-EX01. What actions must you take to run an unattended installation of Exchange Server 2010 server on ABC-EX01? ABC.com is using Microsoft Exchange Server 2010 as their messaging solution. The ABC.com network contains a server named ABC-EX10. You receive instruction from ABC.com to add the Hub Transport Server role on ABC-EX10. What command can be used for installing the Hub Transport Server role? ABC-SR11 has the Front-end role installed and is running Exchange Server 2003 SP2. ABC-SR12 has the Back-end role installed and is running Exchange Server 2003 SP2. ABC-SR13 has the Client Access role and the Mailbox role installed and is running Exchange Server 2010. ABC.com is using Microsoft Exchange Server 2010. The ABC.com network contains a server named ABC-EX10 configured with the following roles: Client Access role. Hub Transport role. Mailbox Server role. The ABC.com network contains a server named ABC-EX10 that contains a mailbox named KingMail. What action must you take to shift the transaction log files of KingMail? B. You should run ServerManagerCmd.exe-IP Exchange-All.xml. The ABC.com network contains a Mailbox server named ABC-EX10. What action must you take to have mailboxes retained for 8 weeks after deletion? A. You must create a legal hold. B. You must change the mailbox database properties. C. You must create Transport protection rules. D. You must create Personal archives. ABC.com is using Microsoft Exchange Server 2003 as their messaging solution. You have added a new server to the network and deployed Exchange Server 2010 on it with the default settings. What command must be used to change the default email address policy? A. You must use setup /NewProvisionedServer. B. You must use lpsetupui.exe. C. You must use Set-EmailAddressPolicy. D. You must use Setup.com /AnswerFile:Exchange-All.xml. ABC-EX01 is running Exchange Server 2007 and ABC-EX02 is running Exchange Server 2010. What actions must you take to shift a mailbox on ABC-EX01 to ABC-EX02? A. You must use msiexec.exe from ABC-EX01. B. You must use the New-MoveRequest cmdlet from ABC-EX02. C. You must use wecutil qc from ABC-EX02. D. You must use wuauclt.exe /detectnow from ABC-EX02. Braindump2go Latest 70-662 Exam Dumps Released! 100% Real Questions – Dumps Qulification is the secret of Success! Prepare yourself to Face the 70-662 Exam with Real Exam Questions from Microsoft Official Exam Center, walk into the Testing Centre with confidence.